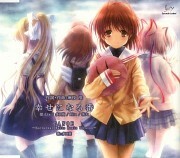 Tagged under Yukimaru Katsura, Kyoto Animation, Key (Studio), Games, Series. When he was young, Yukito Kunisaki's mother told him of a winged girl in the sky. Yukito's family has been searching for this girl for generations. Finally, Yukito's journey takes him to a small seaside town where he meets Misuzu Kamio, a girl who is eager to make friends with Yukito. 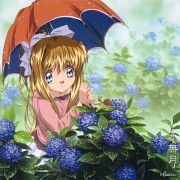 Yukito ends up staying with Misuzu and her mother, Haruka, while he searches for the girl in the sky. In the town, however, there are strange occurences, and as the days pass by, Misuzu starts to have strange dreams. What is the truth behind Misuzu's dreams and her failing health? And how is everything connected to Yukito and his journey? The manga adapted from the game is illustrated by Yukimaru Katsura. Air is supposed to be one of those shows I love. Now the show did have all the ingredients necessary to create one hell of an experience; great animation, moving music, adorable yet fragile characters and more. But essentially Air is like a cake batter that has concrete added to it just before you bake it (the concrete obviously being the plot). It weighed down and absolutely ruined what would be an otherwise tasty cake (no more cake analogies I promise). Of course, if a stirring plotline isn't a requirement for you to enjoy a show, then this still may prove to be a wonderful experience. If viewed simply as a superficial work of cute characters, then it's bound to be a good time. 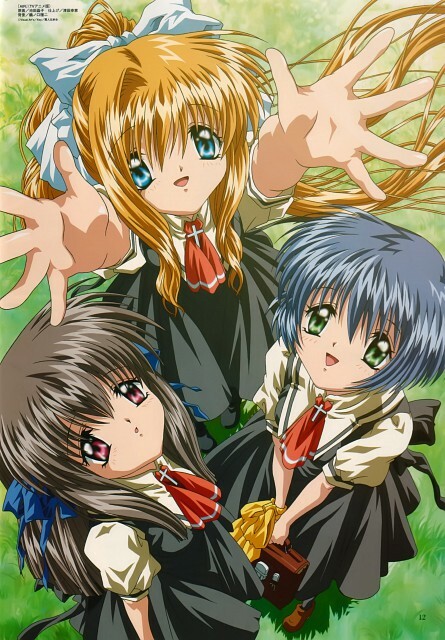 A deep and touching series that wrought emotions from me, I loved the TV series adaptation of the visual novel. By the time the finale of the came around, my feels were rather spent from crying at both the end of Minagi's route in the scene with her and Michiru on the rooftop and the tragic fate of Kannabi-no-Mikoto. Both Minagi and Kanna are my favorite heroines of this series as I found their stories the most heartrending and as for the characters themselves in their personality traits; I loved Minagi's gentle warmth, kindness, and how multi-faceted she is and with Kanna, I found her fiery nature rather quirky and is also quite charming when she shows her sweet side. As for the film, the film strays off from the VN so it's best to watch the TV series before the movie, but it gets a plus for showing Yukito x Misuzu and Ryuuya x Kanna romance goodness. Air was a roller coaster of emotions. Which is good and bad. My biggest issue with it was I had trouble figuring out what the hell was going on. They tried to pack so much into such a short anime series that they ended up having to have weird jumps to explain certain things. So that by the climax I was left just as confused as I was sad. It's a decent watch and probably one that will be remembered for many years to come. It´s the 2nd of my favs! Air is a story about a girl like any other that has the dream of flying, her name is Misuzu and she is the funny one that always falls on her nose and gets up with durt in her face and smiles at you XD . She has a happpy summer with Yukito ( the protagonist) and other girls that you want to see, trust me it´s really funny...but sad sometimes. In the end...I can only say that it has the perfect ending of all times! AIR is one of my favorite series; both the series and the movie are definite "must-see"s. The animation is fantastic, the music and voices are wonderful, and the story is very touching. This is a great addition to the KEY anime collection. I personally recommend watching the series and then the movie if you intend to watch both, and I DO recommend watching both because the movie is not just a recap of the anime, it is an entirely different story with the same basic point. Overview: An amazing and beautiful anime, but extremely sad. family bonds is moving and touching especially towards the end. Although still don't understand what really happened to the main female lead. Was it entirely due to the curse her previous life endured? Why did the main male lead turned into anything but a crow? Find all very weird. Another one of Key's production, I like the polished animation like many of key's anime and visual novels like Clannad and Kannon it has a magical storyline and definitely takes you on a journey of a lifetime. Although it is confusing sometimes to figure out some element of the story but it is nonetheless enjoyable to watch and well-crafted. The character development are the most important when it comes to the plot of a good storyline so in my opinion Air anime has certainly done that. Would recommend it if you are into story with some substance and more focus on characters rather than fan service. Well, the Series was a little confusing since it went along the true reincarnated line - after a while. The story in itself was nice but I have to admit the Movie made more sense then the TV Series. Overall - a nice little show that by ever end of an episode you'll find yourself on such a cliff hanger that you have to watch the next and the next and before you know it. There is no more ep's to watch but in the end it is a tear jerkier. And I wish they'd of made more of it. Giving her more of a chance. That's just my thoughts. I prefer the movie. The anime series is a bit more confusing and the ending is more open, however, the movie, while shorter, leaves you with a better taste in the mouth, I think the end is better and more beautiful. Sadder? No, they are both equal in that but I do recomend the movie. This anime is about as tragic as one gets. This anime had a really amazing storyline along with an equally amazing cast as well. You'll come to love every one of the characters by the end. Regardless of how much of a man you claim to be, if you have a human heart, you'll definitely cry shall the moment call for it. Words cannot possibly describe how well put-together this anime was as a whole, and why it deserves a rating of nothing less than a perfect 10. This one starts out boring, and doesn't change pace. It' tells a slow story about a slow death that has no point that I picked up on -- other than telling a long, slow story about someone's journey to an unnotable death to be up in the air in the sky. It's one I wouldn't recommend wasting time on. Probably 'G' rated, but maybe 'PG' for talk about themes of death.